Janis and I discussed next summer's trip and so far we are kicking around the idea to another trip to Utah. We are now experienced with road trips with kids and dogs so we can branch out in new directions. Rather than go through Colorado - we thought this time we could go through South Dakota and up through Wyoming and come down through Salt Lake. We may be able to get to Yellowstone too. A trip to Yellowstone has always been a dream of ours. I know Grayson would love to see a dude ranch or two. I know they have them by Richfield, Utah because we met some people who were staying at one. I saw this sign in Chamberlain, SD on a trip out there a couple years ago with Guy. Chamberlain South Dakota has one of the largest population densities of Prairie Rattlesnakes in the country. This sign makes the previous sign (no hitchhikers!) on this blog look tame. I read all about the prairie rattler and we'll be fine. Maybe Kaylee will stick to her wee wee pads while we are Chamberlain, SD though. I'm just saying an 8lb Shih Tzu would be in "deep weeds" with a rattler bite. 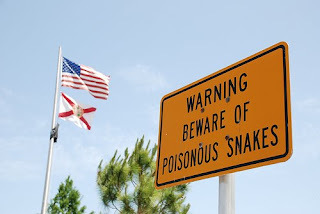 There are no poisonous snakes in Minnesota - just harmless garter snakes. Minnesota kids run right up to snakes because they are cool - very little fear. I once found a ball of garter snakes under the muskeg (swamp) by my Grandmas cabin. That's how they over-winter - they all get together in a huge ball of thousands of garter snakes. Cool.